Adaptive sports programs offer a fun, social way for people with disability to be more physically active and improve their self-image at the same time, through pursuits ranging from tranquil fly-fishing to intense rock wall climbs. The benefits of getting physically active are clear—decreased risks for many chronic diseases, as well as improved mobility, mood, and quality of life. Yet, able-bodied people still participate in low numbers and, among people with lower extremity disabilities—who stand to gain equal and, arguably, greater gains—participation rates are even lower. Adaptive sports programs aim to up the numbers of people with disability taking part, and advances in prosthetic technology, along with a growing awareness of the physical and psychological rewards of such activity, have opened a range of sporting pursuits to recreational and elite athletes. The Paralympics’ growth in popularity has paralleled significant performance gains by athletes with disabilities; 2012 was also a year that saw an amputee athlete—sprinter Oscar Pistorius—compete against able-bodied runners in the Olympics for the first time. “[Guttman’s] perception of sport and individuals with disability was that it could be competitive and exciting, which in turn plays a vital role in rehabilitation. 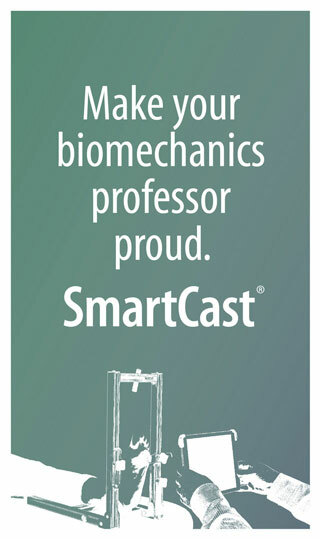 These words, for me, ring true to this day,” said Sarah Curran, PhD, BSc(Hons), a senior lecturer in podiatry at Cardiff Metropolitan University in Wales, UK, and editor in chief of Prosthetics and Orthotics International. Events such as the Paralympics are inspirational and aspirational, showcasing elite achievement and technical skill as well as cutting-edge technology. And individuals playing at more recreational levels aren’t being left out. 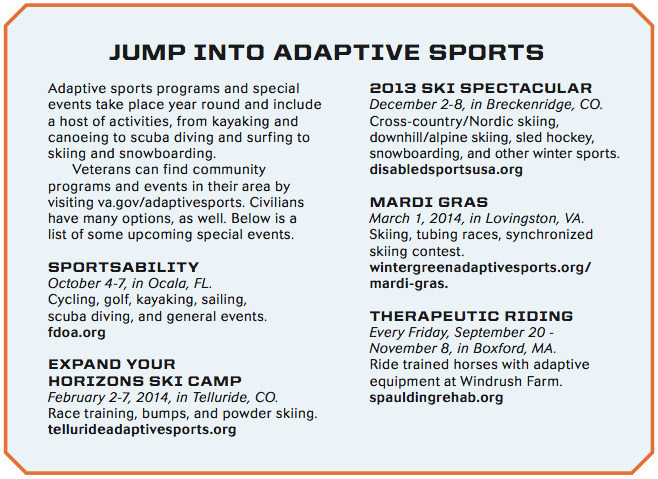 Adaptive sports programs are increasingly available and offer and array of activities—something for almost anyone who wants to take part. Athletes, whether elite or recreational, reap significant benefits, Curran said. “In terms of pure benefits from a daily perspective, participation in sport offers goals and aids in mobility and independency,” she said. Like the able-bodied population, however, people with lower extremity disabilities participate in sport at low levels. “Although we can’t overlook the important physical benefits of sports and regular physical activity, which are significant for able-bodied and disabled persons alike, I consider that the most important benefits [for amputees] are the psychosocial ones,” said Mihai Bragaru, PhD, who authored the 2011 Sports Medicine review and received his doctoral degree in June from the Department of Rehabilitation Medicine at the University of Groningen in the Netherlands. Neil Lundberg, PhD, CTRS, assistant professor of therapeutic recreation at Brigham Young University in Provo, UT, has focused on psychosocial issues among amputees in his research. Participants reported feeling stigmatized and stereotyped as devalued and incapable. “People expect less of you mentally and physically,” is a representative statement from the interviews. They reported, however, that adaptive sports provided opportunities to build social networks and experience what they often termed “freedom”—freedom from the negative aspects of disability and freedom to participate more fully in new activities. “In some ways it [adaptive sport participation] becomes a bit of your identity—it’s a way you can enhance your self perception, and say, ‘Yes, I do these things, and they’re physical things. I’m still present in the physical world, I still can achieve physical things,’” Lundberg said. Jason Wening, CPO, LPO, MS, FAAOP, facility manager of the Lincoln Park office of Scheck & Siress in Chicago, noted that adaptive sports programs can provide a comfort zone for people with lower extremity disabilities to get into or return to sports. Spinal surgeon Kenneth Lee, MD, who, along with leading an adaptive sports program for spinal cord injury patients through the Milwaukee VA, is a wounded veteran who rehabilitated through adaptive sports, also highlighted the effect of participation on self-esteem and self-confidence. Despite the intervention’s short duration, participants’ scores on tests of mood disturbance, depression, and anger—negative states commonly associated with PTSD—significantly improved from baseline. The vets also had significantly higher scores on measures of vigor and perceived competence. Experts at the US Department of Veterans Affairs recognize the power of adaptive sports to improve the lives of its wounded soldiers and have invested significant resources in sports programs, said Chris Nowak, national director of the VA Paralympic Program, a former marine who underwent a below knee amputation, and a Paralympic ice hockey player. 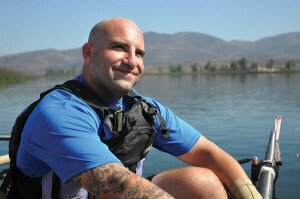 “The VA recognizes sport as a form of healthcare and as a critical part of the rehab process,” said Nowak, whose own participation in adaptive sports, which began with a skiing clinic, gave him the confidence to return to sports he played before his injury and, eventually, to rise to a highly competitive, challenging level. Wounded military personnel are introduced to adaptive sports very early in rehabilitation, Lee said. Lee noted the potential benefits of sports participation also serve as good motivators for wounded soldiers. The VA encourages vets to take their sports activity as far as they can, and currently has 111 individuals on national or Paralympic teams, though Nowak noted that building Paralympians is not the VA’s goal. Nowak noted that the Valor Games, three-day sporting events organized in different regions around the country, are aimed at bringing adaptive sports close to home. Nowak said advances in prosthetics have helped drive the growth of the VA’s adaptive sports programs. 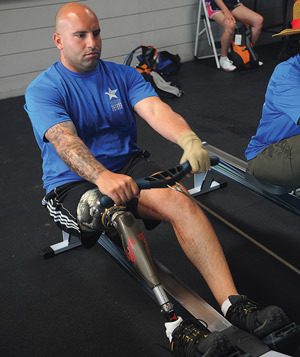 “Senseless war has really pushed the prosthetic field light years ahead of where it was, and that’s really what has allowed veterans to get engaged in sports early after injury,” he said, noting gel liners, sockets, and diverse types of knees increase comfort so much that wearers can push themselves harder and longer and gain benefits more quickly than in the past. 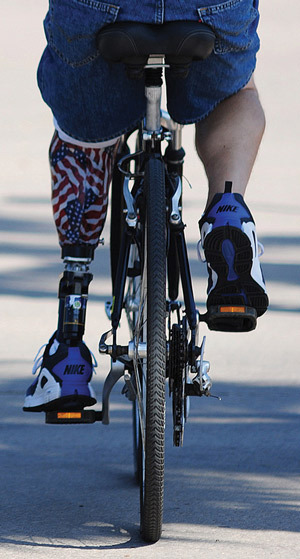 Orthotic design has also advanced to meet the needs of wounded soldiers. 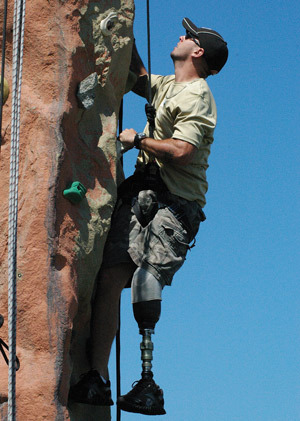 Limb salvage, common in recent conflicts, can leave veterans with significant pain and mobility limitations, and many consider amputation so they can receive a prosthesis that will allow them greater activity. 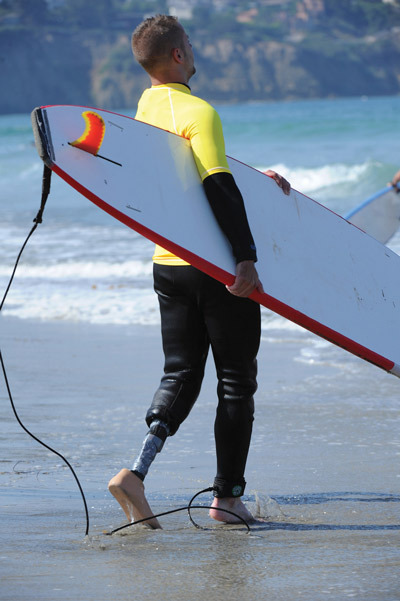 Mihai Bragaru cautions that not all individuals with lower extremity disabilities will be able to jump into adaptive jogging, surfing, skiing, or other demanding sports. “There are some individuals with serious, life threatening conditions who cannot exercise [at intense levels]. 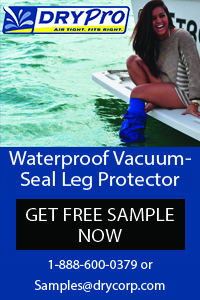 For these, other sorts of therapies, perhaps yoga or water gymnastics, would be more appropriate,” he said. And there are other obstacles. Sarah A. Deans, MSc, P/O, MBAPO, FHEA, a teaching fellow in the Department of Biomedical Engineering at the University of Strathclyde in Glasgow told LER that, based on her 2012 literature review,26 barriers outnumber facilitators for sports participation among prosthesis users. “Our review identified physical issues such as stump pain, embarrassment, psychosocial issues such as poor perception of body image, and low preamputation levels of physical activity as significant barriers to taking part in sport,” she said. He found the most significant obstacle is the same as for the able-bodied population—motivation. Nonathletes in the study commonly identified a lack of transportation to sports facilities, poor health, and lack of a sports partner as barriers to activity. Compared with nonathletes, athletes tended to focus on problem solving and advantages of sport participation—staying healthy, making social contacts, and decreasing daily tension and phantom limb pain were common themes. 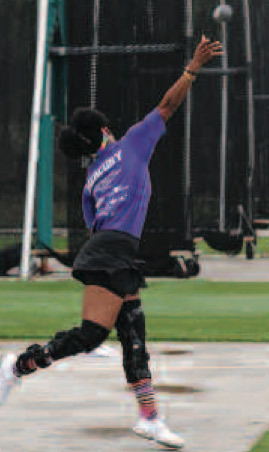 Deans said a barrier identified in her review was a perception by those with limb absence that “high activity” prosthetic components are required to participate in physical activity or sport. Wening called this idea “a major modern myth,” noting that, with increasing media coverage and public interest in high-profile disabled athletes equipped with the most advanced devices, people who wish to participate at more recreational levels often mistakenly believe they need similarly sophisticated—and costly—devices. Insurance varies widely in the US, but it’s uncommon for payers to cover specialized devices, said Wening, a bilateral congenital below knee amputee and Paralympic medalist (swimming) who now runs recreationally—in his everyday prostheses. Similarly, one of his patients who is an avid, though not competitive, cyclist rides regularly wearing his everyday AFOs. Bragaru said he doesn’t see the lack of sport devices as the biggest barrier to participation. “More than half of lower extremity amputees are older than 65, have a vascular or cardiac illness, and are mostly sedentary. Even making available such a prosthesis will not get them moving,” he said. It’s these patients, said Wening, who often lack awareness of resources. 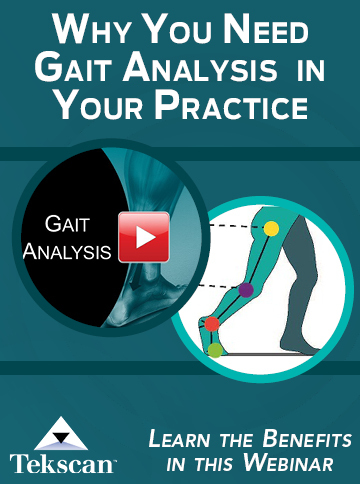 Bragaru and Lee suggest clinicians interested in helping their patients get active start with incremental steps, whether they be toward getting a particular patient interested in physical activity or building an adaptive sports program. Lee, who will lecture on adaptive sports at the upcoming American Academy of Physical Medicine and Rehabilitation conference in October in Washington DC, said one focus of his talk will be to advise practitioners interested in beginning programs to start small. 1. Curran SA. Paralympics 2012: creating a foundation and determining success. Prosth Orthtic Int 2012;36(3):255-259. 2. Paralympic Games. International Paralympic Committee web site. http://www.paralympic.org/TheIPC/WWD/ParalympicGames. Accessed August 25, 2013. 3. Bragaru M, Dekker R, Geertzen JH, Dijkstra PU. Amputees and sports: a systematic review. Sports Med 2011;41(9):721-740. 4.Pepper M, Willick S. Maximizing physical activity in athletes with amputations. Curr Sports Med Rep 2009;8(6):339-344. 5. Bakalim G. Causes of death in a series of 4738 Finnish war amputees. Artif Limbs 1969;13(1):27-36. 6. Naschitz JE, Lenger R. Why traumatic leg amputees are at increased risk for cardiovascular diseases. QJM 2008;101(4):251-259. 7. Bhuvaneswar CG, Epstein LA, Stern TA. Reactions to amputation: recognition and treatment. Prim Care Companion J Clin Psychiatry 2007;9(4):303-308. 8. Pitetti KH, Snell PG, Stray-Gundersen J, Gottschalk FA. Aerobic training exercises for individuals who had amputation of the lower limb. J Bone Joint Surg Am 1987;69(6):914-921. 9. Chin T, Sawamura S, Fujita H, et al. Effect of endurance training program based on anaerobic threshold (AT) for lower limb amputees. J Rehabil Res Dev 2001;38(1):7-11. 10. Tomaszewska J, Hildebrandt M. [Investigations of pulse, blood pressure, respiration and muscle strength during skiing classes for leg amputees]. Chir Narzadow Ruchu Ortop Pol 1965;30(5):557-561. 11. Kurdibaylo SF, Bogatykh VG. [Swimming as a means of enhancing the adaptive potentials of the disabled after amputation of the lower extremities]. Vopr Kurortol Fizioter Lech Fiz Kult 1997;1:25-28. 12. Centers for Disease Control and Prevention. Adult Participation in aerobic and muscle-strengthening physical activities—United States. MMWR Morb Mortal Wkly Rep 2013 May 3;62(17):326-330. 14. Instel T. Director’s Blog: Healing Invisible Wounds: An Action Plan. National Institutes of Mental Health website. http://www.nimh.nih.gov/about/director/2013/healing-invisible-wounds-an-action-plan.shtml. Published August 13, 2013. Accessed August 31, 2013. 15. Desmond DM, MacLachlan M. Affective distress and amputation-related pain among older men with long-term, traumatic limb amputations. J Pain Symptom Manage 2006;31(4):362-368. 16. Copuroglu C, Ozcan M, Yilmaz B, et al. Acute stress disorder and post-traumatic stress disorder following traumatic amputation. Acta Orthop Belg 2010;76(1):90-93. 17. Armed Forces Health Surveillance Center. Amputations of upper and lower extremities, active and reserve components, U.S. Armed Forces, 2000-2011. MSMR 2012;19(6):1-27. 18. Lundberg NR, Taniguchi S, McCormick BP, Tibbs C. Identity negotiating: redefining stigmatized identities through adaptive sports and recreation participation among individuals with a disability. J Leisure Res 2011;43(2):205-225. 19. Wetterhahn KA, Hanson C, Levy CE. Effect of participation in physical activity on body image of amputees. Am J Phys Med Rehabil 2002;81(3):194-201. 20. Tatar Y. Body image and its relationship with exercise and sports in Turkish lower- limb amputees who use prosthesis. Sci Sports 2010;25(6):312-317. 21. Disabled USA Sports Survey. Disabled Sports USA website. www.disabledsportsusa.org/about-us/survey. Published February 12, 2009. Accessed September 4, 2013. 22. Lundberg N, Bennett J, Smith S. Outcomes of adaptive sports and recreation participation among veterans returning from combat with acquired disability. Ther Rec J 2011;45(2)105-120. 23. Fischer H. Congressional Research Service Report for Congress. U.S. Military casualty statistics: Operation New Dawn, Operation Iraqi Freedom, and Operation Enduring Freedom. Congressional Research Service web site. www.fas.org/sgp/crs/natsec/RS22452.pdf. Published February 5, 2013. Accessed August 28, 2013. 24. Lawrence S, De Silva M, Henley R. Sports and games for post-traumatic stress disorder (PTSD). Cochrane Database Syst Rev 2010;(1):CD007171. 25. Patzkowski JC, Blanck RV, Owens JG, et al. Comparative effect of orthosis design on functional performance. J Bone Joint Surg Am 2012; 94(6):507-515. 26. Deans S, Burns D, McGarry A, et al. Motivations and barriers to prosthesis users participation in physical activity, exercise, and sport: a review of the literature. Prosthet Orthot Int 2012;36(3):260-269. 27. Bragaru M, van Wilgen CP, Geertzen JH, et al. Barriers and facilitators of participation in sports: a qualitative study on Dutch individuals with lower limb amputation. PLoS One 2013;8(3):e59881.